Our focus at this time is breeding for improved genetics as well as supplying excellent customer service. In addition to top quality alpacas for sale and stud service, it is our pleasure to offer agisting/boarding with daily hands-on, loving care for your own alpacas. The pastures allow plenty of room for grazing. Let us help you start your own herd today! Ongoing after sales support: Your success is our success. 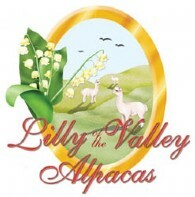 Lilly of the Valley Alpacas' mission is to breed and market healthy alpacas of superior quality while providing caring, knowledgeable and individualized service to our clients. We are dedicated to providing support and education to new alpaca breeders to ensure their success. In pursuit of our mission, we intend to use the highest ethical principles of good stewardship and responsibility in how we treat our alpacas, our clients, our land and our community. Our goal is to exceed expectations.